This service is used by clients across a wide range of industry sectors to fulfil their need for secure, reliable and easy to use document collaboration software that provides a central repository for all project documentation and communication, or for task management software that empowers managers and supervisors to allocate work to teams or individuals that can be reviewed and monitored online. 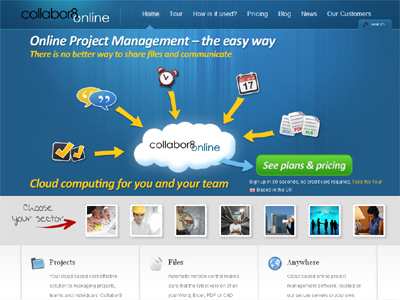 Collabor8Online allows you to communicate with teams, individuals and lets you keep track of tasks/project milestones. 2: Extremely cost-effective solution compared to its competitors.